A soul-swapping experience occurs in the life of Han Xiao when his younger self ends up in the body of his adult self and vice versa. Will he be able to find love? 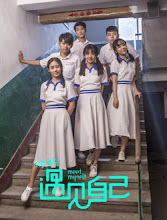 Han Xiao (Wang Xi) leads an ordinary and uninteresting existence. Without realizing it, he often recalls moments from the past and thinks back to the beautiful memories from school when he had a secret crush on Xia Xiaomo (Zhang Xinyi). He wonders whether changing the past will lead to a brighter future and whether he'd have a chance with the person that he likes. In another dimension, a young Han Xiao doesn't dare confess his feelings towards Xia Xiaomo. He wishes that he would grow up quickly, so that he's be free from controlling adults and finally get a chance to end up with the person that he likes. A supernatural encounter allows the adult Han Xiao to return to the past while his younger self ends up in the present day. Wang Gang finally gains the courage to confess his feelings to Sun Yan. Han Xiao doesn't find Xiao Xiaomo at the place where she works, but inadvertently answers a phone call. What will their future be? Let us know why you like Meet Myself in the comments section. Please also share these fun facts using the social media buttons below.